The key to selling products is a good advertisement and effective marketing. Whatever your product may be, you will need to advertise it to take it to a level where people know its name. if your company is making a good product, but it is nor increasing the sales still it only means that your product is not reaching its audience. You need advertisement to boost your sales and earn profits. Advertisements are print, electronic and many other forms but the most effective of these all is advertisement through the internet. This is the era of the internet. Everybody around the globe is connected via internet and to sell your product, what could be better than to advertise it through websites? Ad networks act as a moderator between the two parties. The advertiser and the publisher or the website owner. This way if you want to advertise one of your products through a website, and need some help finding appropriate websites with your desired audience, the ad networks will act as a broker or a dealer to help you set up with some website owners. Similarly, website owners can contact ad networks to help find them suitable advertisers for their websites and earn money through the advertising campaigns. Why do you need AdSpyglass? How do you use AdSpyglass? Why should you choose AdSpyglass? 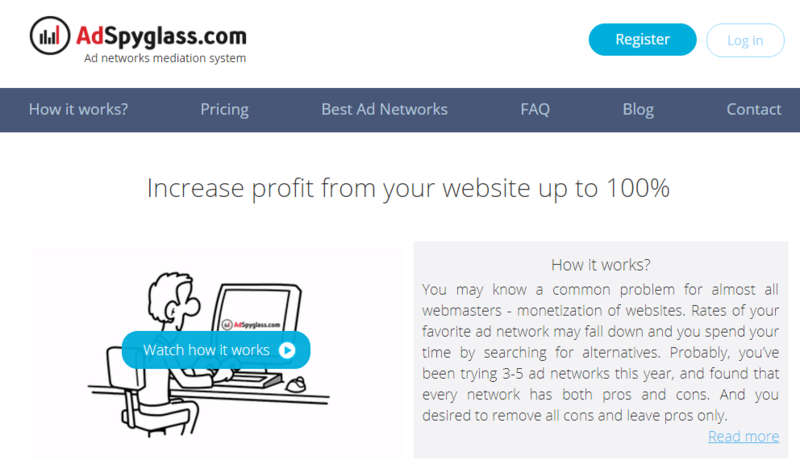 AdSpyglass is a mediation platform that helps you set up with your desired ad networks. The website owners and the publishers need the right kind of ad networks to help find them ads through ad networks, direct advertiser’s ads, and other resources. AdSpyglass helps you connect with the ad networks. However, there are some geographic restrictions as to where certain ad networks will work the best. And we’ll have to figure out what works the best for you and your website. When writing an AdSpyglass review, I feel it my moral duty to explain how it works. While all the ad networks fish for the ads, they connect the advertiser with the publisher websites, based on which website will get the ads the largest revenue. When all the ad spots have been filled in that website and all the ads have been displayed, only then will it move on to the next website. However, this is not the case with AdSpyglass. This mediator hunts for publishers who are willing to pay the most for the ads, thus increasing the monetization values of the websites. Mediators are important because they use a weighted system and match the advertisers with the publishers based on several factors including how much are they paying, as well as the geographic location and other factors as well. They also keep in view the fact that which ads are the most suited for a particular website regarding the audience. You can check their packages and deals and see if they suit you. If you don’t want to buy a package, that’s okay too. You can use their Tax Mode. In the Tax Mode, they will collect some 10 percent of your impressions. And personally, I think, it’s a fair deal, as they are already increasing your websites’ profits up to hundred percent! They don’t feature their own ads! One of the best points that inspired me to write an AdSpyglass review is that they do not feature their own ads on your websites. They strictly just play the role of a broker, to help you connect with the best ad networks. They act as the silent angels, who are there only to help you with no benefit of their own. This is one of the features that made AdSpyglass worthy in my opinion. I know, by experience that AdSpyglass will surely work to increase your profit. You just have to trust and wait for a good 2-3 days, giving them enough time to work through the traffic. After the said days, you can compare the visible results of up to a hundred percent increase in your profits, and all because of AdSpyglass! The profits can range from less than a hundred percent or even more, depending on the traffic of your website. And while AdSpyglass doesn’t help you buy or sell traffic, they highly prefer websites with worldwide traffic. Because they are working on automatic monitoring of CPM, for many different GEOs, so they prefer the sites with worldwide traffic. Now let’s all come straight to the point. What are the best ad networks that will help you set up with the advertisers? These are all the names of some best ad networks as per this month suggested by AdSpyglass review. All of these networks offer the CPM types while some of these may also offer CPC, CPL, and CPA types too. One of these, the propellerads.com also offer the Smart CPA type. One of the best pros about these ad networks is that they are open for all the desktop as well as the mobile traffic type. A majority of the people are using smartphones these days. Almost every other person has a phone connected to the internet in his hand, it is very important to target this kind of traffic too because it constitutes about half of the internet users. And by including the mobile traffic as well as the desktop traffic you can increase your profit double fold. These websites have set up different payment frequencies, ranging from daily to twice weekly, once a week, once a month and so on. You can choose the payment type and frequency according to your own feasibility. They are accepting multiple payment systems so that the client doesn’t have to go through the trouble. All the payment methods like PayPal, Bank Transfer, Bitcoin, Paxum, Payza, etc., are all in use. So, choose the option that suits you the most. AdSpyglass helps you set up with the ad networks that are most feasible for you and your team. AdSpyglass works with the cream of ad networks. So, if you’re associated with them, you won’t have to worry if you’re missing out on any good ad networks. They connect you with the best ad networks possibly present for you. And according to AdSpyglass, you should use the maximum of 5-6 ad networks, but it mostly depends on your traffic. The ad networks can come and go depending on your web traffic. We know that it can be pretty frustrating working with multiple ad networks. The rates may fall for one of the ad networks and you may find yourself in the search of an alternative but what should you do> spend all of your time in searching the ad network that will suit your needs or the other option I that you appoint all of this trouble to AdSpyglass. They will take care of everything you need and help you connect with the ad networks with the largest CPM. Yes, they actually work like that. AdSpyglass will take care of all of your ad networking websites by continuously comparing their CPM values and they will pair you up with the one that has the highest value at the time. And suppose, after a day or two, its value falls down, then they will automatically pair you up with the one that now becomes the highest CPM rate. You won’t have to go through the trouble of keeping in check all of your ad networking sites all the time. You and your team can sit back and relax while AdSpyglass does your work for you. In this AdSpyglass review, one thing that I cannot emphasize enough on is the fact that how much AdSpyglass makes it all easier for you! forget the trouble of monetizing the websites, because they have got you covered. With them, you can get guaranteed income boost of up to one hundred percent. Of course, that depends on the traffic of your website, but still, you’ll be able to see a vast difference in the profit results just in a day or two of hiring AdSpyglass. Stay assured of the complete transparency of the data that they collect. When you want to put up an ad, you won’t need to change the ad templates every time, because all the change will be made through AdSpyglass admin panel, hence saving your time and helping you steer clear of any mistakes. So, this AdSpyglass review is basically suggesting you should totally go for AdSpyglass for increasing your profit values and for monetizing your website.